1) To get this look, I used three coats of Forever 21 Love & Beauty’s Baby Blue Nail Polish, topped with one coat of Seche Vite Fast Dry Top Coat. Pieces Helle Jade Stone Ring via ASOS – as reviewed by me here. 2) This was created using Wet ‘n’ Wild’s Wild Shine Nail Color in Blazed. If you are going to buy just a few different nail colors this summer, I highly, highly recommend Blazed. The coral/orange/pink color is perfection for manicures or pedicures; plus, the application and lasting-power is incredible. I wore this color on my fingernails for six days, and never experienced a single chip. As for my toes…I have had this color on for two weeks, and no chips. It is amazing! This is three coats, topped with one coat of Seche Vite Fast Dry Top Coat for added shine. Arrow Connector Ring via Forever 21. 3) Here I used OPI’s Care to Danse? from the New York City Ballet Collection. Care to Danse? is actually a sheer color, wherein your nail-line would show through; however, I wanted to make it opaque, so I used five coats to do so, topped with one coat of Seche Vite Fast Dry Top Coat. It seems time-consuming to use so many coats; but each layer dried super quickly, and the after-results were gorgeous – so, I’d say it’s well worth it. Ring via Forever 21. 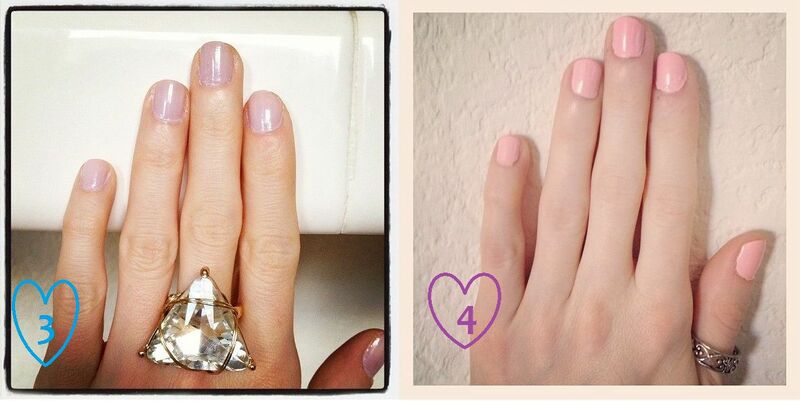 4) To create this lacquer I used Forever 21’s Love & Beauty Baby Pink Nail Polish. Sadly, I could not get it to show in the picture, but this color brings out a tan in the wearer. I’m fairly pale, but when I use it for pedicures, it actually makes my feet/legs look super tan – definitely desirable during the warmer months. This is three coats, topped with one coat of Seche Vite Fast Dry Top Coat. Ring via Target. I'm wearing two sally Hansen shades: xtreme wear in Lacey lilac and gem crush in big money on my accent nails! I really like picture #4. That shade of pink makes me smile. Love the colors! Sweet rings too! I'm always in love with pink. It has been had for me to get used to the light shades of summer. But, I'm finally in love with Sally Hansen's 06 AIR. From the Smooth Perfect line. I love number 2. The arrow ring is so cool too. Loving all of these colors - so perfect for summer! Such amazing rings! I want number 1. These are some of my favorite post of yours. All of these manicures are gorgeous and you always manage to find the most beautiful rings. I'm especially loving look 2. I love the coral color. I thinking about doing something patriotic with my nails in honor of Memorial Day. Cute cute nails! I love that baby pink! I never find the perfect shade of pink, and I love that color! Gorg! 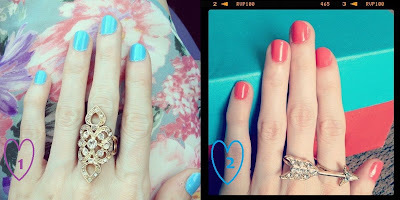 Are you happy with the formula of the F21 polish? I've been tempted before because they have great colors and the price is so amazing but I always resist because I wonder about the quality. 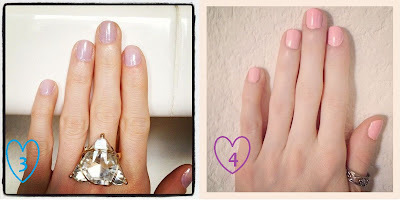 I love all of them, but number 3 with the dusty pink may be my favorite! I am rocking NOTHING for manicure monday unfortunately, not enough time before work! Hope you are having a wonderful day! The baby pink nail colour is so pretty. I have a similar shade which I can't wait to try on. And you have the most gorgeous rings. I really love Wet n Wild's nail polish, so cheap and really lasts! I love that Forever21 color! oh you just have the prettiest nails. especially bc i'm not into fake ones that much (I can appreciate on others but tips regarding them mean nothing to me). These looks are SO great!